With wide bracelets the height of the bracelet is usually measured as if it was sitting on a table. All of our models are made of genuine cow leather and can often be locked at several different lengths. When we talk about leather bracelets for men one must note that there are three different kinds of leather: top grain, full grain and split leather. Split leather is the lowest quality and sometimes has a top layer that is not made of leather. At Trendhim we mostly sell bracelets made of top grain or full grain leather, though for some smaller or thinner bracelets it's not possible to use this type of leather. Wide leather bracelets fit well with a casual outfit, are masculine and make a great accessory when wearing any type of t-shirt. To measure what size bracelet you need, you should use a measuring tape or piece of string and measure around your wrist, just above the wrist bone. 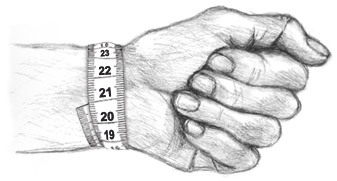 When measuring your wrist, the measuring tape should not be too snug. You should add 0.8 inces (2cm) to your wrist measurement to get the ideal bracelet size. See the example above where the wrist measures 8.25 inches (21cm). Here, the man should look for a bracelet of around 9 inches (23cm) in circumference. Should you be selecting the bracelet as a gift, or for some other reason, do not know the exact size, here are some general guidelines. You can filter by size for all the bracelets at the top of this category.